Barfly's Beat: The Empire Room opens! "At 3,500 square feet of brushed stainless steel, a generous curved marble bar, tufted banquettes, glass-topped tables and Art Deco chandeliers, it accommodates up to 150 people in sophisticated style in a former postal substation." We look forward to putting on our best duds and making the scene at "the Empire." 11 a.m. to 3 a.m.
Crème Yvette is a French liqueur produced from violet petals, berries,vanilla, and spices. This liqueur appears in most vintage cocktail books, such as David Embury's The Fine Art of Mixing Drinks (republished by Mud Puddle Books) and is an essential modifier in such classic cocktails like the Aviation. Sadly, Crème Yvette has been out of circulation since 1969. Well now it is back thanks to the folks behind St. Germain elderflower liqueur, Cooper Spirits International. According to Imbibe Magazine, Mr. Rob Cooper, who runs Cooper Spirits, happens to have the good fortune of inheriting the family business - Charles Jacquin et Cie of Philadelphia. This company has owned the original recipe for decades; now producing and importing the much sought after liqueur from France. This is quite a coup. Frankly, I am curious to see what other liqueur ancienne Mr. Cooper will be resurrecting next! Those who are familiar with Crème de Violette, another violet liqueur that is produced by the Austrian company Rothman & Winter, will notice a significant difference in taste and color. First of all, Yvette tastes of honey and vanilla notes, and has a strong berry flavor. Secondly, the color of Crème Yvette is similar to sloe gin, a dark ruby hue. This adds a pink color to the cocktails of which it is an ingredient. In my view, the flavor profile and visual appeal is an upgrade from Crème de Violette which can be too floral and gives many cocktails a grey color rather than the desired purple. For your consideration: A list of de-lovely vintage cocktails that use CrèmeYvette, enjoy the time warp! We suggest Plymouth Gin for all of these drinks. Combine ingredients in shaker and fill with ice. Shake rigourosly until welll chilled, strain into a cocktail glass. Float the Crème Yvette and garnish with a lemon peel. Shake over ice and strain into a cocktail glass. Garnish with a lemon twist. One of our favorite nightcaps, this gem first appeared in the Savoy Cocktail Book (1930). Combine in shaker. Dry shake ingredients to emulsify the egg white. Add ice and shake well until frosty. Strain into chilled cocktail glass. Dry shake the ingredients to emulsify the egg white, then add ice and shake it hard for 20 seconds. Strain into a collins glass and top off with club soda or seltzer. Pour the Crème Yvette into a glass flute and top off with Champagne. Where to get Crème Yvette? We suggest getting on the waiting list, this product is flying off the shelves. "Dances of Vice celebrates the music and culture of the Harlem Renaissance in the hottest strut in town with our dapper MC Dandy Wellington, burlesque beauty and songbird Dulce de Leche, 1920s style tap sensation Jen Minsky of the Minsky Sisters, the salacious syncopations of Grandpa Musselman & His Syncopators, and the swingin' Adriel Azure & His Dream Indigo Orchestra. $16.50 Advance, $20 Doors, $10 for Wonderland Ball ticket holders. MUSIC: Duke Ellington, Fats Waller, Cab Calloway, Ethel Waters, Louis Armstrong, Lionel Hampton, Jelly Roll Morton, Billie Holiday, Lena Horne, Dizzy Gillespie, Bessie Smith, Fletcher Henderson, Ella Fitzgerald, &c."
Last month, barkeeper Damon Dyer's Monte Cassino won critical acclaim and the title of official cocktail for the 500th Anniversary of DOM Benedictine Liqueur. 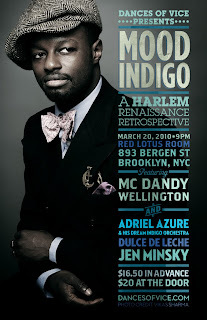 I caught up with Mr. Dyer at the Flatiron Lounge on a slow Friday night. He began rolling the award winning cocktail as soon as I sat down and we discussed how he came up with the winning recipe. To appreciate the cocktail's building blocks, one must understand history. Mr. Dyer chose the ingredients and the name based upon the story of the Benedictine monks of the Abbey of Monte Cassino. The monastery located southeast of Rome was founded by St Benedict of Nursia in 529 AD. Yes - the Saint Benedict who went on to establish the eponymous order of monks. 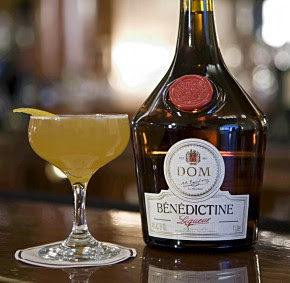 The same Order that produces DOM (Deo Optimo Maximo) Benedictine liqueur. The monastery served as the headquarters of the Order of Saint Benedict and history has not been kind to the structure or it's inhabitants. It was sacked and destroyed several times during the middle ages by marauding invaders, such as the Lombards and the Saracans. The monks rebuilt it again and again. In 1321, an earthquake seriously damaged the structure but still the monks rebuilt. The coupe de grace seemed to occur during the Second World War when the abbey was destroyed by the Allied bombers in 1944. However, the Monks' faith and determination to rebuild remained unwavering. Strength and simplicity are central to the monks lives and the perseverance behind Monte Cassino. These principles are the cornerstone to the cocktail's balance. Rittenhouse Rye (Bonded) is the perfect representation of that strength and compliments the complexity of Benedictine's 27 herbs and spices. Yellow Chartreuse another monastic produced liqueur keeps the "Last Word " proportions honest but also adds another layer of flavor and balances the final ingredient, fresh lemon juice. The result is a well balanced cocktail is refreshing, produces a subtle earthy flavor, has the strength of serious cocktail, and is relatively easy to execute. Combine in shaker, add ice, and shake until stingingly cold. Strain into a coupe and garnish lemon peel. While, Mr. Dyer built my second Monte Cassino, I ran a drink idea by him. Since reading about the 500 year anniversary of DOM Benedictine contest last year, I have been tinkering with my own recipe that honors the liqueur but also tips the trilby to the iconic Italian macchina, the Fiat Cinquecento ("500" in Italian). In other words, DOM meets MOD, a drink that you could have in Torino or West London or Brooklyn. May I introduce a delicious new aperitivo! Where to get the Monte Cassino - find Mr. Dyer at Flatiron Lounge (37 West 19th Street, New York, NY 1001) or Louis 649 (649 East 9th Street, New York, NY 10009), tell him Fredo sent ya! A few weeks ago, we had the pleasure of attending the Dining & Libation Society's Fat Tuesday celebration at the Flatiron neighborhood's newest addition, Rye House. It was our first DLS event and what sold us was the venue and the gang behind the dark wood oak bar. The Ringers: The top shelf talent behind the bar included Lynette Marrero and Jim Kearns (previously of Freemans and Woodson & Ford) rolling vintage New Orleans cocktails that included the Vieux Carre (pronouced Voh Cah-ray), The Sazarac, French 75, and an original recipe called the Baton Rouge. The Party: Brooklyn’s premiere Dixie Land Band, the Red Hook Ramblers set the tempo with some hot New Orleans jazz in the back room. Meanwhile, the bar was packed like Bourbon Street and I mean that literally. They had to begin bring the passed hors d'ourves through the front door because revelers in the front of the house were getting nothing. When the food started flowing, it was well worth the wait. Macaroni and cheese balls. Jambalaya. Turducken. Crayfish Po Boys. Oysters on the half shell. And so much more. Best part of the evening was when Lynnette and Jim prepared the quintessential New Orleans cocktail - The Ramos Gin Fizz - and then handed the shakers to the crowd gathered around the bar. The task - to shake - Huey Long style for 12 MINUTES! Lynnette was timing it too and enjoying the break from the non-stop service. The Regulars: We want to add that Rye House is a great place to get a cocktail any day during the week. So don't give it up for Lent. Besides the outstanding barkeepers, 50 types of whiskey, artisanal cocktails, and oh so bad for you comfort food, it is come as you are. The mission statement does not include trying to be a speak easy but it is not a typical New York watering hole. True, the barkeepers wear vest, shirts, and ties, but in my view, that is proper attire for a craftsman or craftswoman. Save the ironic t-shirts for after hours at the dive bars and flat screens for the sports bar. One of my favorite poisons at this House of Whiskey has no whiskey at all! May we indulge you with the Creole Daiquiri. They had me at Chorizo infused mezcal but this potable hits a home run because it is so well balanced. Combine ingredients in mixing glass, add ice, shake rigorously and serve up in a coupe. Shake with ice and serve up in a coupe. 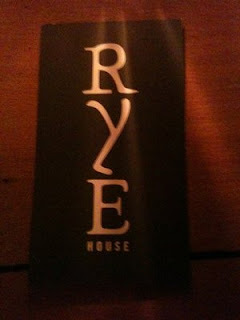 Please check out Rye House. Sample their whiskey selection or original cocktails. You will not be disappointed.